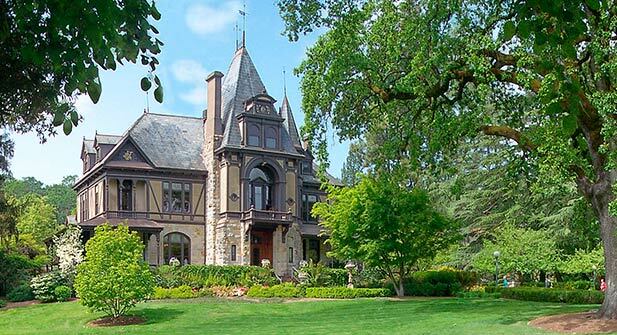 When I think of the Beringer name, I think of bottles on grocery store shelves and White Zinfandel, rather than a luxury estate and luscious Cabernet. 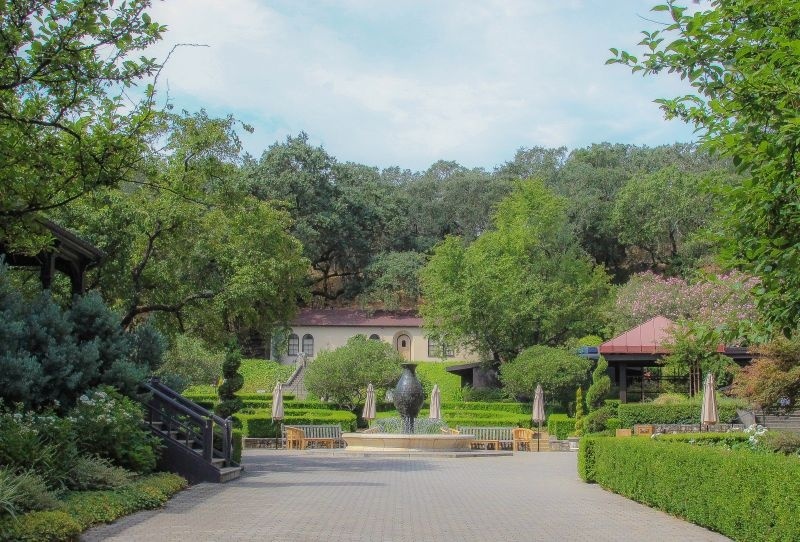 Last week, I had the opportunity to challenge those preconceptions and in doing so discovered an unexpected treasure in the Napa Valley. 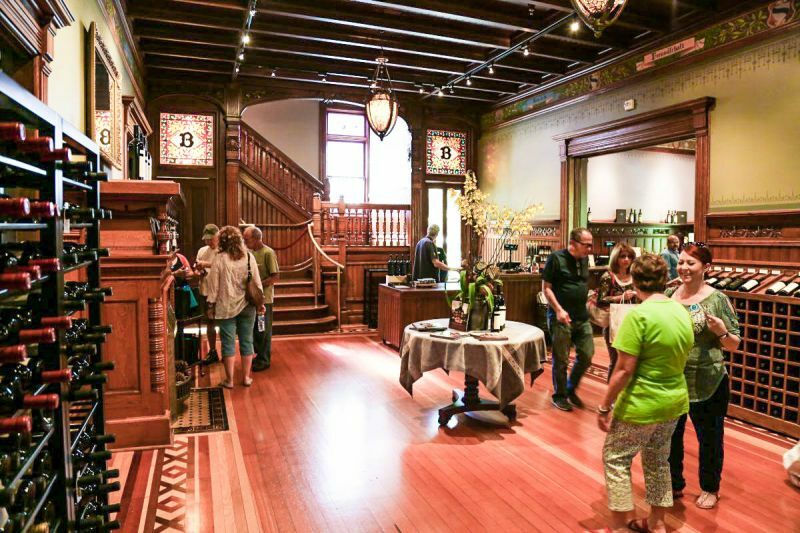 I was invited to tag along on the Taste of Beringer Tour. I had never been to the property before, although we have passed it often on Highway 29. I have to tell you that my mouth dropped open touring the grounds. They are beautiful and unexpected. It was like being transported back to Germany in a far more graceful time. The architecture and the gardens are beyond stunning. The tour was described to me as “A tour for the senses”. I have to agree with that very apt summary. 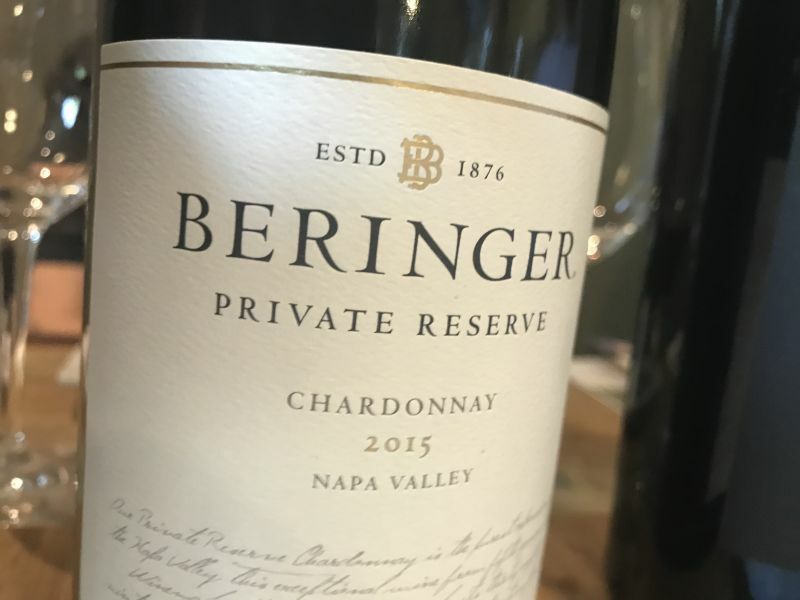 We started off with a glass of their 2015 Private Reserve Chardonnay ($48) as we listened to the background and history of the estate and the two German brothers who created it. We walked around the grounds and past the two main houses on the estate. The Hudson House was our first stop on the tour. 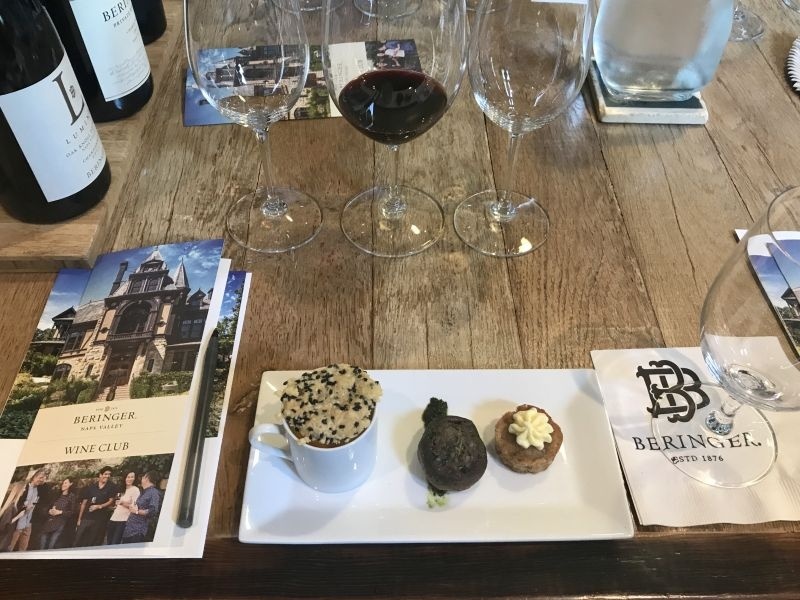 We got to hear about the amazing culinary program Beringer has proudly pioneered for many years and about the current property chef who now lives in the house. Our next stop was a stunning courtyard surrounded by gardens. 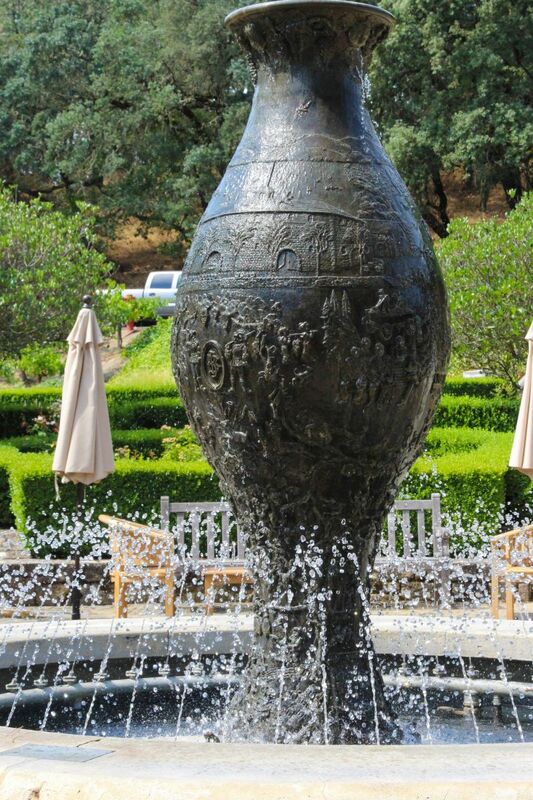 In the center of the courtyard sits a stone urn fountain, cast by a local artist, that features all kinds of hidden items on it; including an image of Marven Gaye (a nod to his hit – “I heard it through the grapevine” with the California Raisins). Unfortunately, unless the fountain is shut off, the images cannot be seen clearly. That alone charmed me and the memory of those commercials made me smile. 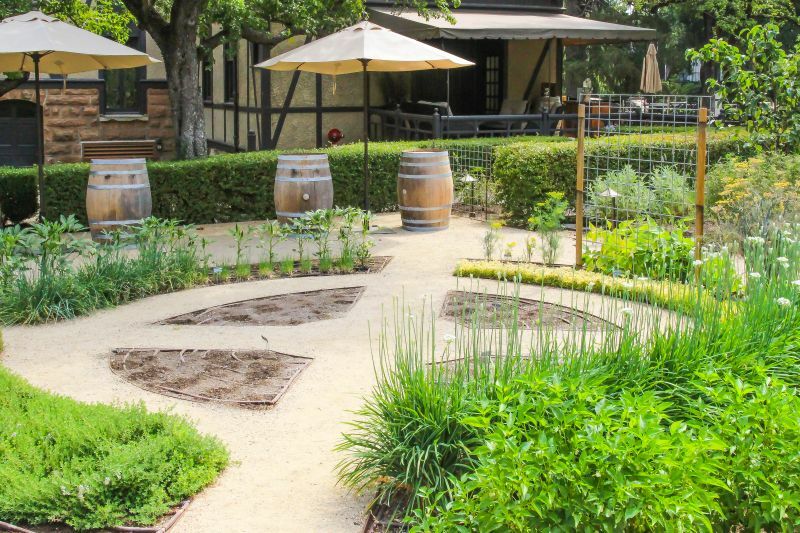 It was then on to the part of the tour that I found the most fascinating; a wonderful way to learn how the wine relates to the environment in which it is grown and how it takes on the flavors of nature. 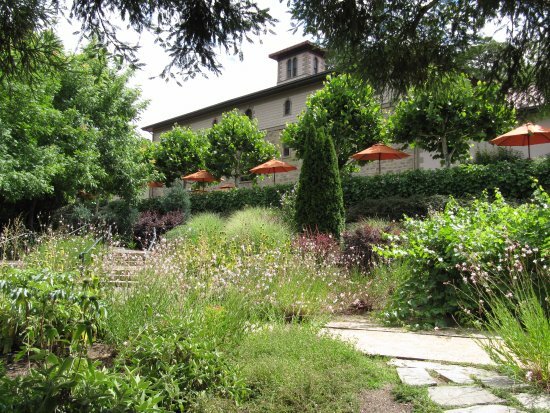 Our group was guided through a gorgeous garden filled with herbs and plants whose flavors and smells filled the senses. Lemon verbena, lavender, basil, and sage were just a few to stimulate and train the olfactory senses so you could later find them in the wine. So many people don’t understand when wine experts talk about a wine having a nose of cloves, or flavors of cassis, or a hint of lime. This is a layman’s opportunity to learn in a fun way. Our host, who was both knowledgeable and fun, then took us to the “petting vineyard” where he gave our group the opportunity to see how grapes are grown, explain a little of the process and the cultivation. 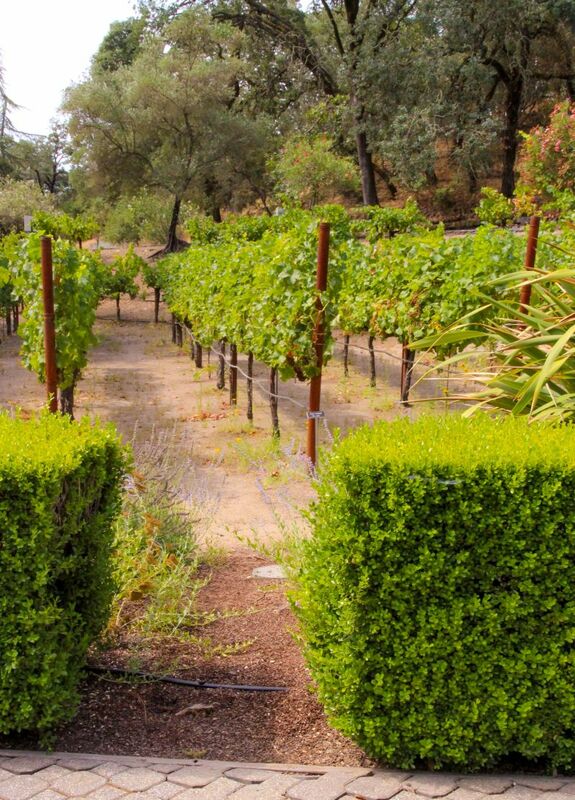 How better to learn about wine than as the grapes are growing right in front of you? After being given a cool washcloth to wipe away the oils and smells from our hands, we were lead into the Rhine House for a seated tasting and food pairing. 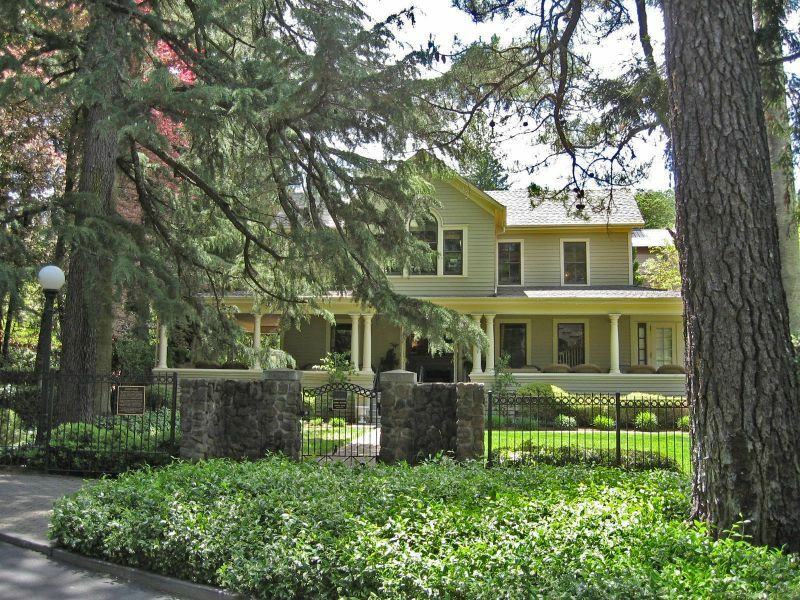 The interior of the house is what you’d expect, and more, of a grand house of its age and stature. Gorgeous craftsmanship is everywhere you look; with stained glass, gleaming wood, and architectural details. The ceilings are made of solid hardwoods so that no knots show; it’s incredible. Sitting down to the paired tasting was a fun experience and, I thought, extremely well done. The chef prepared three cold bites to enjoy with our wine. One with a slight spice, one earthy, and one sweet. The first bite was a curried carrot gazpacho soup served with a black sesame seed and parmesan crisp. 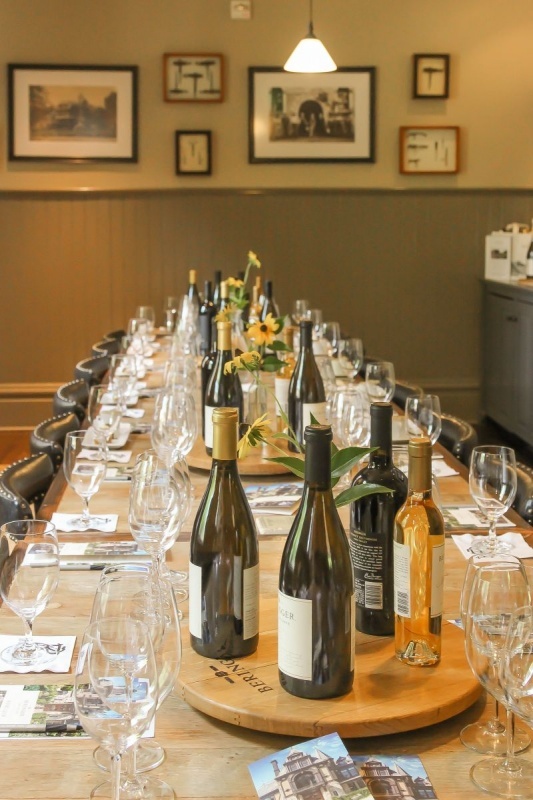 It was paired with their 2015 Luminous Chardonnay from the Oak Knoll District ($38). The minerality, bright lemon, and silky unoaked flavor of the wine blended beautifully with the flavors of the very delicately spiced, curried, carrot soup. My favorite combination of flavors was next; a duxelles-stuffed mushroom (A mushroom stuffed with sauteed, seasoned, and chopped mushrooms) and the 2014 Private Reserve Beringer Cabernet Sauvignon ($60). The mushroom’s savory flavor and meaty texture cleverly took the place of a big piece of red meat with the wine and it was a match made in heaven. Something I have never thought to do in the past. (I am totally stealing this idea from the chef for my next dinner party.) The wine itself had notes of dark forest fruits on the palate with a slightly musky nose. I loved how approachable and ready to drink the wine is. It can be cellared for about five years, as I feel like it will peak about then. Our last taste of the day was a zucchini and lemon cake with a buttery cream cheese frosting. They paired it with their 2013 Private Reserve Nightingale Sauvignon Blanc/Semillon Dessert Wine ($48). One of the joys of eating this dessert and drinking a sweeter sip is that the combination of the two made each a little less sweet; like magic. The wine itself tasted of citrus, melons, and lightly floral with a rich sweetness. 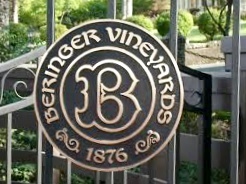 I loved my tour and time at Beringer. It was wonderful on so many levels. I enjoyed the beauty and history of the buildings and the inspiring story of the two brothers who built it. The sensory garden tour was outstanding and very educational. Finally, the paired tasting experience was a delight for the palate. 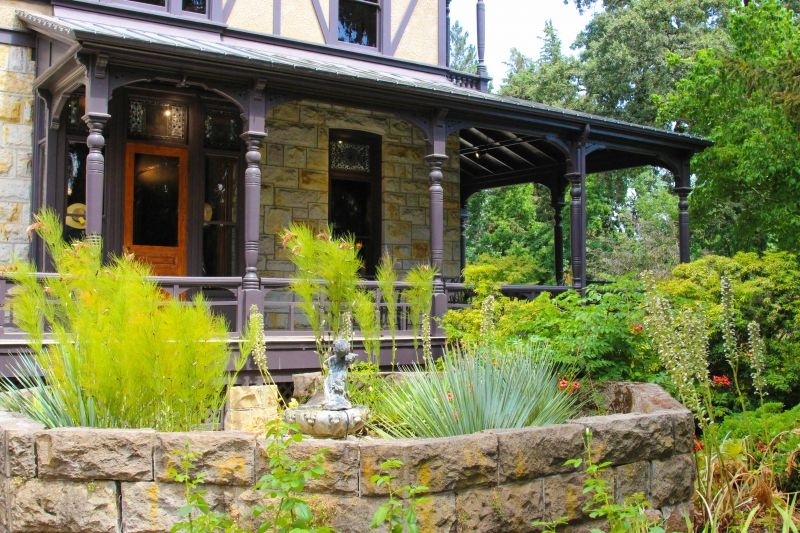 I came away enthusiastic about both the property and the wines. I’d love to return to do their cave tour, which I am told is absolutely stunning.